K3, P2 . . . It’s a three–two count. You only have one ball left. Do you have enough yarn to last all nine innings? This could be quite a dilemma when you are a baseball knitter. As a baseball Mom, I understand the value of supporting the team. From T-ball to Little League to BabeRuth League, and all of the assorted practices in between, I have been in the stands to provide encouragement (and snacks as needed) for both of my baseball-playing daughters. That adds up to a lot of hours—a lot of knitting hours. With all of the travel games, it would have been nice to discover a local yarn shop for a little bit of me time. 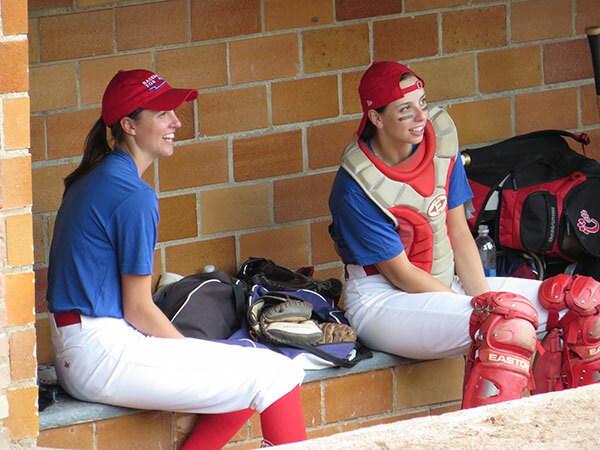 Kathy Augustine’s daughters Gabrielle Augustine (pitcher) and Stephanie Augustine (catcher) played in the 2014 Baseball For All Tournament held at Doubleday Field in Cooperstown, New York. Photo by Kathy Augustine. Cooperstown, New York is home to the Baseball Hall of Fame and Doubleday Field. Thousands of people converge annually upon this tiny hamlet to pay homage to the legends of the game. Youth baseball teams from around the country and their families will pilgrimage to the area for the opportunity to participate in the numerous tournaments held in the many surrounding fields. But just a few miles down the road in Milford, New York is Sybil’s Yarn Shop, a wonderful fiber oasis in the land of baseball. The shop, a part of the community since 1973, changed ownership in 2017 when the founder, Sybil Osterhoudt, retired and passed her business on to the very capable hands of her daughter, Jeanetta Osterhoudt. 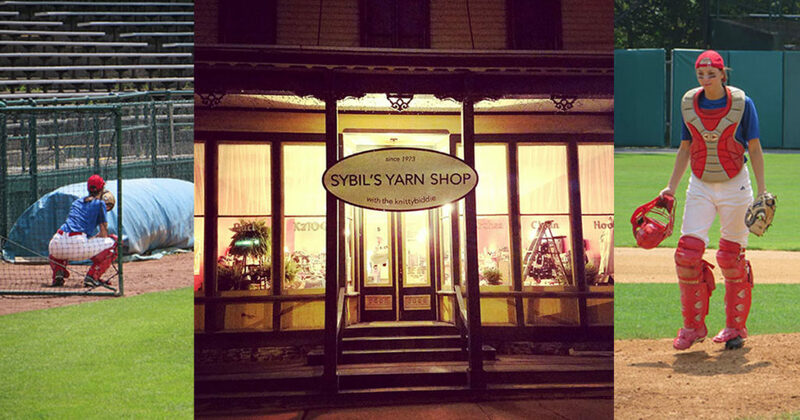 Sybil’s Yarn Shop in Milford, New York—a fiber oasis in the land of baseball. Photo by Jeanetta Osterhoudt. 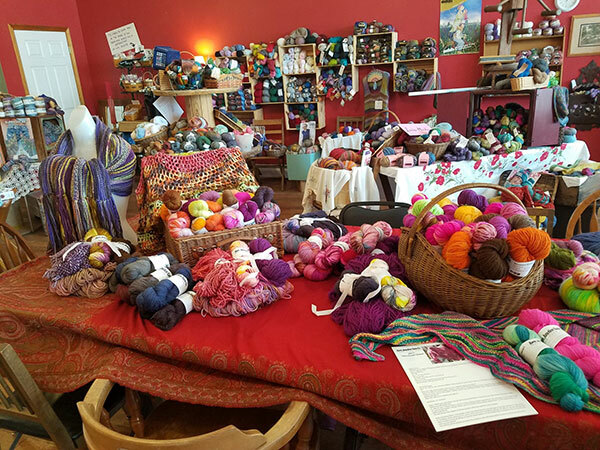 Instead of watching a pitcher windup and deliver their fastball with a 3–2 count, patrons of Sybil’s are winding balls of yarn and counting their knits and purls. Its inviting atmosphere beckons to the bleacher weary baseball knitter and offers a place of refuge to recharge both the stomach and the soul. Coffee, tea, and snacks from a local baker are available to shoppers while they browse books, enticing knitted samples, or the multitude of alluring, luscious skeins displayed around the store in baskets and vintage suitcases. Project kits, local fleece and yarn, instructional classes, and sit and knit times are just a few of the benefits available. The inside of Sybil’s Yarn Shop. Photo by Jeanetta Osterhoudt. 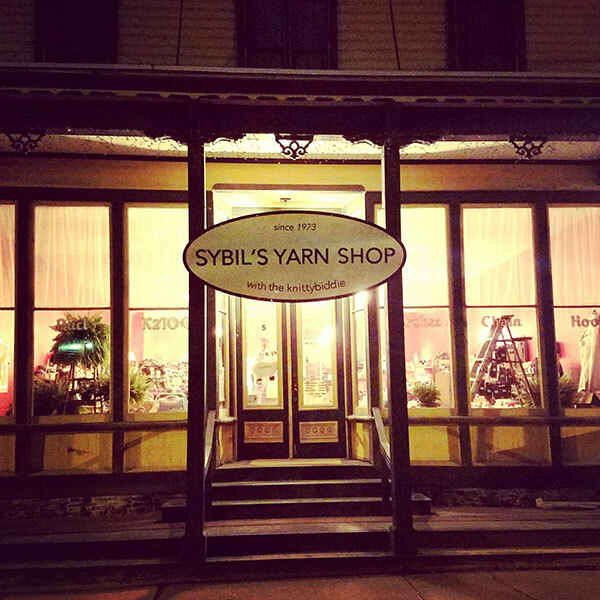 Sybil’s Yarn Shop offers much so more that just a seventh inning stretch. Bolstered with inspiration (and perhaps a small treasure filled shopping bag) baseball knitters return to the field refreshed and ready to cast-on. So, take me out to the ballgame . . . after I’ve stopped by my local yarn shop. Kathy Augustine is a fiber enthusiast and shepherd to a small woolly flock. She lives in Pennsylvania with her family of humans, cats, dog, sheep, and a goat. Join the baseball knitters with one of Kathy’s designs! Coffee & Knitting: What Could Be Better?